I wish there was something I could tell every new mom. I have found TWO products that have given me peace of mind during Briella's first year. I have not been compensated in ANY way, and I actually paid for both of these items at full price. First off, an infant bathtub. I purchased this while Briella was still in the NICU. 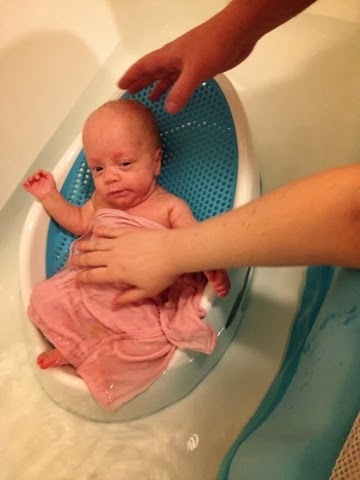 It was most like the sling that was used in the hospital to give her a bath. This tub supported her body and kept her in place. She couldn't squirm down and I never worried about her slipping into the water. I placed the tub directly into the bathtub. My favorite thing about it is that when I'm pouring water over her hair to rinse, the water immediately drains through the bathtub holes instead of pooling in the tub. 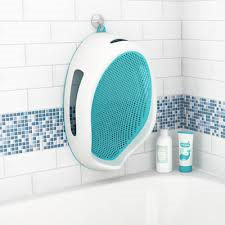 We hung it up on the wall when we were finished with the bath to store it out of the way. We just recently stopped using it at 16 months/20lbs as she enjoys sitting up and playing with toys now. I posted pictures from Briella's 1st week home taking a bath in this AngelCare bathtub. 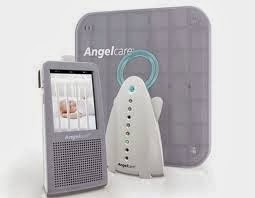 The AngelCare Monitor is a product that has allowed me to stay sane. Since my 23 weeker came home from the hospital without any oxygen or monitors I was terrified. For 120 days I was able to see her stats on the hospital monitors and now I was just supposed to not worry? I caught myself staring at her lips to make sure they weren't blue, I would obsess over watching her chest to make sure it was rising with each breath & when I would doze off I would have my hand on her to feel the movement of her breathing. After googling for a solution I found the AC1100 monitor which has video on top of the breathing detection. It also gives me the temperature in her room & shows me a swinging pendulum on the monitor that represents each breath. I couldn't tell you how many times a night I wake up to simply glance at the monitor to make sure I see that pendulum swinging! My husband followed the instructions for installing it. He placed a piece of quarter inch plywood the size of her mattress under the crib mattress and placed the sensor pad on top. We put a little shelf on the same wall that her crib is on that points the camera at the crib. At 17 months old, we still turn it on as soon as we put her to sleep. I use it at naptime as well. I cannot function without knowing that the monitor is on. It will give a warning beep at 15 seconds of know breathing detected & a full alarm when there is no breath for 20 seconds. It has gone off and I've had to run into her room and stimulate her. Thank God she always takes a breath and is never gasping. I also am 100% sure it works because we have forgotten to turn the monitor off before picking her up. I have read reviews that say there a lot of false alarms. The only time that happens is when she gets tangled up in the slat of the crib. I just reposition her in the middle of the crib and she is fine. I truly believe that most negative reviews are from user error. I count on this monitor so much that I am having one delivered to us on vacation. I simply cannot sleep without knowing my daughter is okay. My husband and I have decided we will use this for along time still. We can use it in her toddler bed also.